Established in 1919, New Era was formerly a distributor for only industrial and automotive lubricants. Over almost 100 years, our range of products has extended to the supply of Red Diesel and Kerosene, and oils & lubricants for commercial, plant, machinery, agricultural and marine applications. 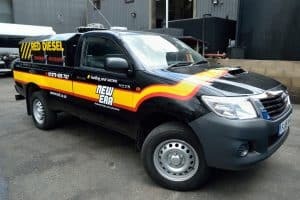 Our primary service is to provide an unrivalled, nationwide delivery of Red Diesel; tracked with the latest technology to ensure accuracy and punctuality. 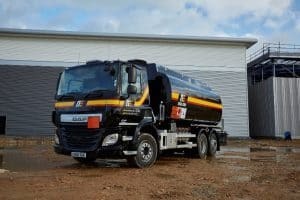 Our own fleet of brand new tankers are based around London & Essex and are regularly maintained & checked to exceed the most recent emission and performance standards. While operating from our Harlow headquarters, we have valued and well-trusted partnerships with distributors across the whole of the United Kingdom, allowing us to provide a delivery service anywhere in the country. ‘We came across FORS when tendering for work across London. When we looked at the requirements and benefits of joining the scheme we saw that they fitted in perfectly with our ethos of improving safety whilst complementing our drive to improve fuel efficiency and reduce our environmental impact’, says Brett Jacobs our Transport Manager. We have improved our MPG on average across the whole fleet by 97.81% compared to our baseline year. We achieved this by making sure we always selected the best route possible to all our sites and we plan ahead before leaving the yard. We get all my drivers to complete a comprehensive Medical Declaration on an annually basis even though the FORS Standard states once every 5 years. It’s also mentioned in the drivers handbook that if they at any point in time start suffering from a medical condition they need to notify the company ASAP as well as if they need to start taking medication prescribed by their GP or over the counter drugs. We will then investigate it to see if it’s still safe for the driver to be driving for the company and we may even ask the driver to get a letter from his doctor informing the company if he is still able to drive for the company. We will then start doing more driver assessments on the driver to make sure he isn’t a risk to the company or anyone on the road. Our Operators yard is located in the middle of Epping Forest – no-where near any schools, hospitals, colleges, residential housing, High Streets etc. We load our lorries using specialist pumps to reduce sound. Servicing and cleaning is done by main dealers at their premises and as we deliver our own products we fill up at our Operating yard and then we go to a site drop it off there. Very rarely would we bring a load back to our yard and if we do it would stay on the lorry which means there is also no added noise. All my lorries have white noise reversing alarms fitted to them. We carry automotive lubricants and fuel to and from construction sites across the whole country. As we rely on our customers asking us to deliver to various construction sites across the whole country, we never know where we are going until they need us. Therefore we can’t afford to try and move anything via barge or train as our Operating Centre is in the Middle of Epping Forest and will never get planning permission to build train lines to deliver our goods. There is no other method than using a lorry and we then asked to deliver anywhere in the country. So using a Lorry is the most cost effective way of moving our clients goods. We are replacing all our lorries with Euro 6 engines as and when they are due. We have looked at electric vehicles and because of the weights we carry and the fact that our lorries have specialist equipment fitted no manufacture have produced an alternative fuelled vehicle that can carry the weight we do and go over the same terrain we do. We will continue using what FORS has taught us to improve our MPG and reduce any wasted idling we might have.